GoodReads Summary:How do you know where to go when you don't remember where you came from? "With what I did yesterday, I should be dead: zapped by the chip they put in my brain when I was Slated." 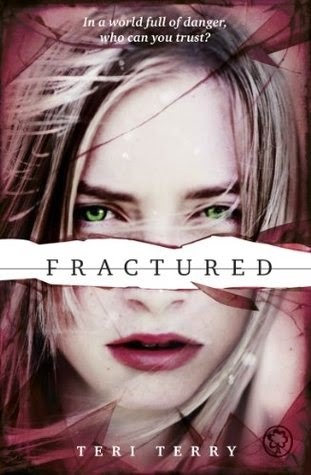 A sequel that packs just as much punch as its predecessor, Fractured does not disappoint! Fractured picks up where Slated left off. As wisps of Kyla's memories start coming back to her she struggles with her identity; between who she is now, who she was before being Slated, and her younger self. But most of all, it washes blood from my skin, my clothes." Terry also has a way with characters, and as much as I want to discuss these complex, multi-layered characters that are not at all what they first appear to be I won't. I think it's best to go into this book unknowing, trying to figure these characters out for yourself and maybe being surprised by what you find, like I was. I will, however, mention Nico, a dark and charismatic character who we were introduced to at the end of book one. I admit to being drawn in by this mysterious young man from Kyla's past, I was hoping he would get more page time in the sequel and he certainty did. Nico is the kind of character who can change in an instant, one minute he'll be smiling, comforting Kyla and the next he's stone-cold, getting straight down to business. It was so much fun unraveling this him, and finding out just what his true motives were. There wasn't much action in the first book, so I thought there would some be in the sequel. And to a certain extent there was, especially towards the end, but there wasn't quite as much as I initially thought there would be. And you know what? I was surprised to find that I didn't care, this is a thriller that doesn't need action to be engrossing. I found myself flying through Fractured, excited when revelations came to light, heart broken when *insert spoiler here*, shocked when *insert spoiler here*, and hopeful when *you get the picture*! I can't wait to read the third and final book in the trilogy, hurry up Spring 2014! I read slated a couple weeks ago and LOVED it. It was a book that I hadn't seen hyped up at all on twitter, but I had been wanting to read it ever since I first read the synopsis months ago. I loved it! I can't wait until I have the opportunity to read Fractured! I'm excited to dig in deeper with these characters and see where the story goes!! I need to read this series Renu! I heard such good things about Slated and I remember reading a bunch of excerpts from it before it came out, so I know I love the writing style already. Glad to know this one does suffer from second book syndrome and is every bit as good as book one! Great Review, Thanks or sharing! I recently read Slated and can't wait to read Fractured. So happy to hear its just as good. Nico definitely sounds like a fascinating character! I can't actually remember him from the first book, though - I may need to quickly flick through the end! You have convinced me to consider the sequel now. I wasn't sure about it at first. :) Great review, Renu! I haven't read the first book yet but I'm glad it's just as good as it! I've seen the covers around but never though about picking up the book before. NIco sounds intriguing! Lovely review. I think I'll have to read at least part of Slated before I read Fractured. I forgot some details, and to be honest, I forgot all about Nico until you just reminded me. I'm still looking forward to it, I really did like Slated. Amazing review Renu!!!!!! I love the way you described Nico; I am now interested in learning more about him. I love any book with great character development, so i'm definitely going to check this book out. I haven't really heard much about this series but it looks like I need to check it out since you liked it so much. I'm curious to find out more about Nico; lol, I love mysterious guys!